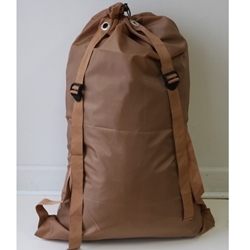 This soft brown laundry bag with TWO CARRY STRAPS measures 24" Wide x 36" Long. The DOUBLE STRAPS allow for a backpack-like functionality. It has a simple to use slip lock closure that is pressed to slide down the rope. It has a nice polyester soft brown color that will enhance the look of any laundry room.